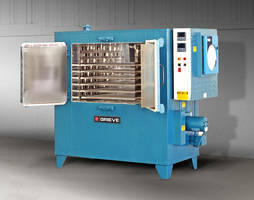 The 500°F Special Universal Oven features 42 x 40 x 50 in. (W x D x H) size workspace. The oven comes with 4 in. 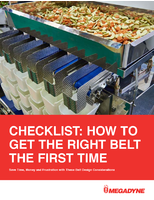 thick insulated walls and Type 430 stainless steel interior. 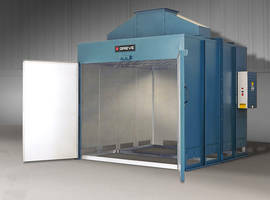 The product is offered with an integral leg stand and four levels of two 3/8 in. NPT pipe ports. 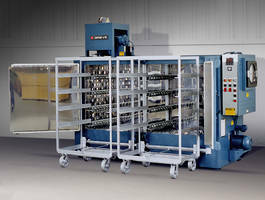 It is equipped with vacuum gauge, ball valve, indicating temperature controller, motor control push buttons and LED pilot lights. No. 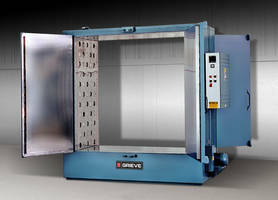 856 is a 500°F (260°C), special universal oven from Grieve, currently used for curing composite parts in vacuum bags at the customer’s facility. 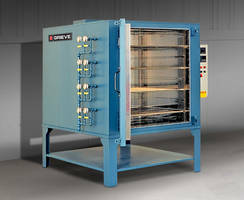 Workspace dimensions of this oven measure 42” W x 40” D x 50” H. 48 KW are installed in Incoloy sheathed tubular heating elements, while a 4200 CFM, 3-HP recirculating blower provides universal airflow to the workload. 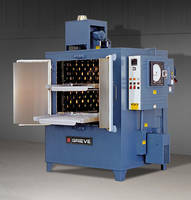 This Grieve special universal oven has 4” thick insulated walls and Type 430 stainless steel interior. Features include an integral leg stand and 4 (four) levels of 2 (two) 3/8” NPT pipe ports connected to common manifold. 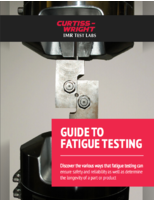 Additional feature include a vacuum gauge and ball valve on each port. Controls on the #856 include a digital, microprocessor based, thermocouple actuated, indicating temperature controller, motor control push buttons, an on-off heat switch and LED pilot lights.